For more premarket data, click on chart. Beyond the retail frenzy, China and important events next week are setting the tone for today's shortened trading session. 1. Shoppers out in force: The annual retail marathon is already well underway. Bargain hunting shoppers are spending heavily online and in brick-and-mortar stores. Thanksgiving Day sales online were already running well ahead of last year's levels, according to data from Adobe, with steep discounts of 24% on average driving higher volumes. Toys, especially Star Wars products, were selling out fast. 2. China mini crash: Stocks in China plunged more than 5% in their biggest fall since the summer market meltdown. The trigger for the latest gyration in Shanghai and Shenzhen was news that the country's biggest brokerage is being investigated by regulators. Citic Securities, and smaller firm Guosen Securities, said in exchange filings that they were being investigated by the China Securities Regulatory Commission. Shares in both sank 10%, the maximum daily limit in Shanghai and Shenzhen. 3. Oil and money: Oil prices are falling by more than 2% to around $42 a barrel. OPEC meets a week from today and the cartel is expected to keep pumping crude at full tilt, despite a continuing global glut and the prospect of a sharp increase in Iranian exports next year. 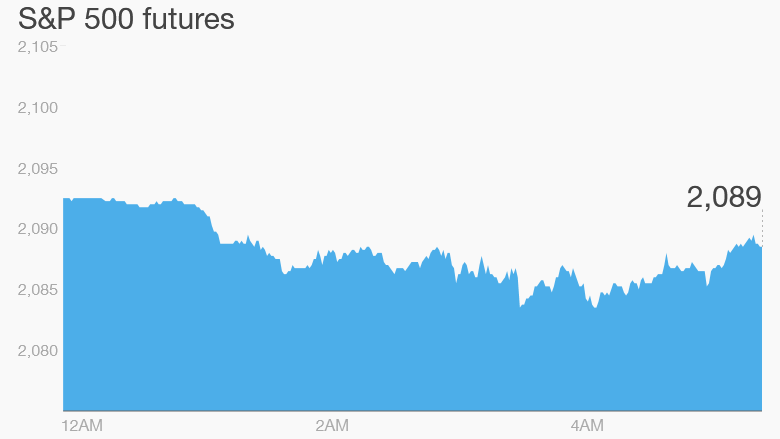 In currency markets, the euro continues its steady fall towards parity with the dollar -- trading down 0.3% at $1.06 -- as investors anticipate that the European Central Bank will slash rates and beef up its money printing program when it meets Thursday. 4. Markets overview: Asian markets ended mostly in the red, following China's slump, while European markets were mixed in morning trade. U.S. stock futures are little changed. 5. Wednesday market recap: The markets were closed yesterday for the Thanksgiving holiday. On Wednesday, the Dow Jones industrial average and the S&P 500 closed even with the day's open, and the Nasdaq gained 0.3%.